In the 4th century A.D. there emerged the Chalukyas (in present Karnataka) and the Pallavas (in present A.P. and Tamil Nadu) in South India. Both these dynasties became very powerful and ruled over the region for about 400 years. However with the reversal of fortune, the Cholas started emerging again as a great power in south India around eighth century A.D. by defeating the Pallava kings and other local rulers. The Cholas bought about the political unification of large parts of the country. 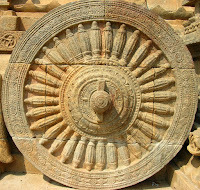 From the mid-ninth century A.D., the Cholas ruled over Tamil Nadu, parts of Andhra Pradesh and Karnataka. To distinguish these kings from earlier ones, who ruled up to 4th century A.D., historians call them as the Imperial Cholas. They built a powerful Navy and conquered Sri Lanka, parts of South East Asia and the islands of Maldives and the Lakshadweep. Thus the Imperial Cholas helped in spreading the Indian culture abroad. The founder of the Imperial Cholas was Vijayalaya (846-871 A.D.), who conquered Tanjore from Pallavas. Parantaka I (907-953 A.D.) another famous king defeated the Pandya kings of Madurai and extended the territory further south. He assumed the title of Maduraikondavana i.e. the conqueror of Madurai. Rajaraja I (985-1016 A.D.) another famous king, first defeated the Chera kings and captured the region of Kerala and then defeated and captured the Pandya kings and took possession of Madurai. The northern part of Sri Lanka became a Chola province under the name Mummadi Cholamandalam under his expedition. After this he overran the Chalukyas of Vengi. He also launched campaigns against Kalinga and the old islands of Lakshadweep and Maldivies. Rajaraj I conquered all these territories and built a maritime empire to control its trade and commerce. He assumed various titles and built the famous temple of Tanjore which is known as Rajarajesvara temple. Rajendra I, son and successor of Rajaraja I annexed the whole of Sri Lanka and reasserted his authority over Kerala and the Pandyas. He turned his attention towards the north and his armies marched right up to river Ganga in the Pala kingdom. After this he adopted the title of Gangaikonda and established a new capital known as Gangaikonda-Cholapuram near the mouth of River Kaveri. He possessed a powerful fleet, which gained success across the Bay of Bengal. He sent a naval expedition in 1025 A.D. for the conquest of the Sri Vijaya Empire. (Sri Vijaya Empire included Sumatra, Java and Malay peninsula). He conquered many ports of Sri Vijaya. The rulers of the Sailendra dynasty of the Sri Vijaya Empire were on friendly terms with the Chola kings. The Sailendra king built a Buddhist monastery at Nagapatnam and Rajendra I on his part had endowed the income of Village for its up keep. In the 13th century, the Cholas were succeeded by the Pandyas of Madurai and the Hoysalas of the Dvara-samudra (Mysore). The Chalukyas of Kalyani in the Deccan were succeeded by the Kakatiyas, who ruled from Warangal (A.P.) and the Yadavas, who ruled from Devgiri (modern Daulatabad in Maharashtra). These dynasties flourish till 14th century A.D. In the beginning of the 14th century A.D. Turkish Sultans of Delhi finally cast their eyes on Deccan and destroyed these kingdoms and captured the areas. The king went on regular tours to ensure efficient administration. The Chola Empire was divided into Mandalams (provinces). These Mandalams were further divided into Valanadus (districts). The tax on the land was collected by the village assemblies. The village assemblies were responsible for maintaining tanks used for agricultural prosperity. There were three types of village assemblies. They were the Ur, Sabha or Mahasabha and Nagaram. The Ur was the assembly of common villagers. The Sabha was the assembly of learned Brahmins and the Nagaram was the assembly of merchants, traders and artisans. The Uttarmerur temple inscription gives a detailed description of the functioning of these assemblies. There were provisions of land survey, Classification of various types of lands and assessment of land revenue. Chola rulers also built a network of roads for the purpose of trade and communication. There were two famous guilds of merchants which flourished for more than 300 yrs. They were Manigramam and Nandadesa. South Indian merchants called Chettis traded with countries of Arabia, Persia, China and the countries of South East Asia. Women were held in great honour and enjoyed freedom in the society that is ruled by Imperial Cholas. They were imparted education in various branches of learning and fine arts. Each temple had an attached Math, which provided free education, food, clothing and boarding to the students. The rulers patronized Buddhism and Jainism as well as Islam and Christianity. There are various Muslim and Christian communities settled in south India. Ramanuja, a religious preacher, who was born at Tirupati around 1017 A.D. tried to assimilate Bhakti to the traditions of Vedas. He made the study of Vedas more popular. Madhava, another religious preacher who preached Bhakti towards Lord Krishna. In south India Nagapattnam and Kanchi were the famous centers of Buddhist learning. But, this was the period of Adi Shankara, who was born in Kerala around 788 A.D. He became well versed in Vedas and other religious scriptures at very early age. He kept moving all over the country preaching his philosophy and debating with the learned scholars. The philosophy of him is known as Advaita meaning non-dualism. He organized ten branches of Advaita philosophy and established four Mathas, namely, the Jyotirmatha at Badrinath in the north, Saradapitha at Dwarka in the west, Govardhanamatha at Puri in the east and Shringerimatha at Kerala in the south. Each math is said to have a Gotra, presiding deities both male and female and Vedic Mahavakya. The location of these maths show that Adi Shankara was looking at India as one religious and cultural unit. The Chola temples show the culmination of a particular style of temple architecture known as Dravidian style. They are marked by the square Vimana in pyramidal shape, Mandapa, Gopuram and halls with profusely decorated columns. The most famous temple of this period was the Brihadeswara temple at Tanjore, also known as Rajarajeswara temple, dedicated to Lord Shiva. Starting during the late Pallava period, the Bronze sculpture reached heights of glory during the Chola rule. The image of the Nataraja (the lord of dance) from Tanjore is a masterpiece of the Chola bronze sculpture. In the southern parts this period saw the flourishing of Sanskrit literature. One of the works is philosophical commentaries of Shankara. Another important Sanskrit work of this period is Bilhana’s Vikramankadevacharita, a biography of the Chalukya king Vikramaditya VI. However, this period is more important for the growth of literature in Dravidian languages. Sanskrit and Tamil were the mediums of expression. Canada and Telugu also developed during this period and made popular by Bhakti saints. Nripatunga wrote a great work of poetry in Kannada called the Kavirajamarga. For a few centuries, the Kannada literature was deeply influenced by Jainism. Pampa wrote the Adipurana and the Vikramarjuna-Vijaya, the former dealing with the life of the first Jain Tirthankara and the later based on the Mahabharata. Poona wrote the Shantipurana, a legendary history of the 16th Tirthankara. Another great Kannada writer was Ranna, a contemporary of Pampa and Poona. Two of his famous works are the Ajitapurana and the Gadayuddha. So Pampa, Poona and Ranna are known as the three jewels of the early Kannada literature. Kamban wrote the Ramayanam in Tamil. In Tamil, this was the period of composition of the great hymns of the Alvars and the Nayannars. The hymns of the Alvars are collected into the Nalayira-Divya Prabandham. Some of the Nayannar works are the Thiruvasagam, the Thirumanairam and the Thiruttondattogai. The Mahabharata and the Ramayana were translated into south Indian languages. Silappadikaram and Manimekalai were the epics occupy a high place in Tamil literature and are revered like Ramayana and the Mahabharata. Telugu also produced great religious and secular literature in this period. This included the translations of the Mahabharata and the Ramayana, works of grammar, science and other secular literature. Nannaya was among the first Telugu poets, who translated the Mahabharata into Telugu and also wrote on Telugu grammar. Literature in Malayalam also started growing.